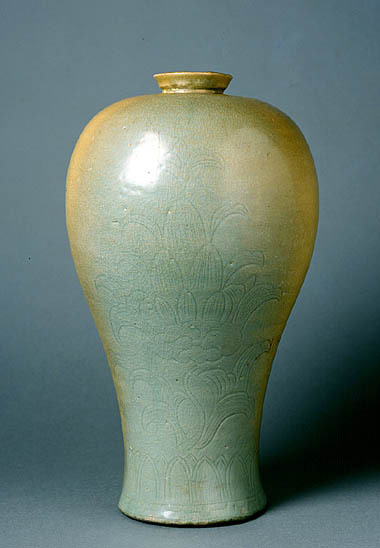 This large maebyong vase is the Korean version of the Chinese meiping-a type of porcelain already appreciated by the Chinese Northern Sung dynasty (960-1127), and regarded by Koryo ceramicists, whose fame is universally acknowledged, as a veritable tour de force. The vase has a delicately executed floral decoration beneath a shimmering blue-green celadon glaze and its elegant form is harmoniously matched at the base by a crown of lotus petals. This perfectly balanced, gracefully profiled maeybong is characteristic of the golden age of the Koryo ceramists. The engraved decoration still displays close affinities with Chinese esthetic models, particularly those of the Northern Song dynasty. On the other hand, the slightly bluish tint is specifically Korean. The floral motifs incised beneath the glaze reveal an unambiguous naturalism and a distinct taste for geometrical proportion and flexible line. Monochrome treatment and the use of virtually unembellished raw material were the hallmarks of Koryo craftsmen. Contemplating this piece, we can see how they explored the visual potential of the material itself in order to obtain the perfect hue. Curving forms and ample volumes were other characteristic features of the Koryo ceramists, echoed in bronze works from the same period. Formally, maebyong ware was associated with a new technique involving inlaid black or white barbotine, introduced in the 12th century and known as sanggam. These elegant ceramics represent a specifically Korean decorative development and epitomize the esthetic discrimination that prevailed during the late Koryo period.